Cook the rhubarb with 2 cups of water on a low simmer until very soft, then either strain to get the liquid (mashing up the rhubarb well to extract the most flavor from it) or blend in a blender. Cool liquid before using. Place ice in beverage shaker then add in the rum or vodka, 8 broken up mint sprigs, half cup of rhubarb liquid and maple syrup. Shake well, taste and adjust with more rhubarb juice or syrup as necessary. 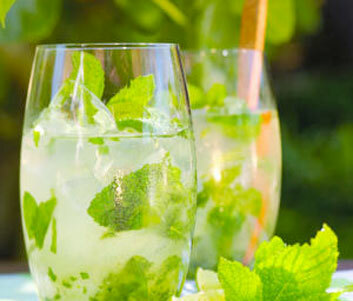 Serve over ice in a high ball glass, topped off with a splash of club soda and a sprig of mint. Makes 4 servings. This recipe is from Cheryl Herrick’s blog, http://crankycakes.com.